“That’s why we are the best. Pamper the man in your life with a gift card from The Governors. Great guys and they know how to cut a man’s hair. Not to mention the shoe polishing service. Once you’ve had one of Shar’s head massages, you’ll never go anywhere else! Great value, great service, definitely a cut above the rest!!! In the weeks after Governors first opened, I came across the team after searching for someone who listened to what I wanted and styled my hair the way I wanted. I have never looked back and now my sons also go to The Governors after I introduced them to the team. Now I have 3 haircuts and products to pay for, one in their 40’s, one in their 20’s, and one in their early teens. A couple of generations of satisfied customers. When in Perth, I always have my hair cut by Spencer at the Governors. He keeps me looking sharp, and the service is just excellent. Spencer has been cutting my hair for over three years now and I have followed him from Central Arcade to Cloisters the new shop he recently opened. I always look for the best service and outcome for everything in life and staying with Spencer to cut my hair, is testimonial of him doing it right every time. I can certainly recommend him to anyone who is after professional service and a consistent outcome. I have been having my haircut at The Governors for over 2 years now. The salons are conveniently located, are clean and tidy and you are always met with a smile. I walk out feeling fabulous and 10 years younger, without it costing a fortune and as such highly recommend Spencer’s teams expert service. Paul Conboy, Associate Director, Representative at CPS Capital Group. I’ve been going to The Governors since their beginnings many years ago and can sincerely recommend them to any guy who wants a quality cut. Even though I don’t work in the city, I’m happy to travel there as I know I can expect the same professional and reliable service that is always delivered with a smile. Thanks Spence for looking after me all these years!! I faithfully got my hair cut for years by an old Egyptian barber in the northern suburbs…getting access to him alone became hard…the people he has working with him were average barbers. A couple of years ago I started going to Spence and his team at Governors and never have to choose any one of the team over another. The are all excellent barbers…consequently I just drop by at a quiet time and take whoever is free…and – from the eyebrows up – come out looking like James Bond! 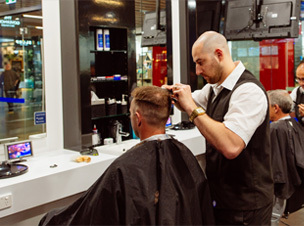 The Governors is a men's barber in Perth CBD, Western Australia. 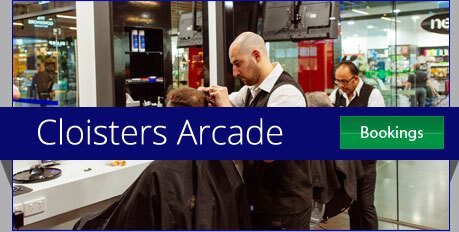 We are located in Cloisters Arcade.